When it comes to cushioning and protecting your things, there’s nothing The UPS Store Certified Packing Experts can’t handle. Big or small, we ship it all. From cars, to clothes to fragiles, our experts are trained in advanced packing techniques. Plus, with our Pack & Ship Guarantee, we back up what we pack up, so you have peace of mind. We specialize in properly packing fragile and high-value items like artwork and antiques, and can package large or odd-shaped items such as golf clubs or sports equipment. Let the Certified Packing Experts at The UPS Store on 590 Centerville Rd do the job for you so your items arrive safely and intact. We're trained in advanced packing techniques like block and race, double box, and suspension. Plus, when we pack and ship your items using materials purchased at our store, you can ship out confidently with our Pack & Ship Guarantee. We'll cover the cost of packing and shipping, plus the value of your items, if they're lost or damaged. Visit theupsstore.com/guarantee for more details. We offer a large variety of standard shipping box sizes ranging from 6x6x6 all the way to 24x24x24. Let us help you select the right box to help prevent bursting or compression. Our boxes are designed specifically for shipping and we can help you determine if your item should be single or double boxed and how it should be packed for maximum protection. Need a different size than what's standard? We can easily create a custom box for you to meet the needs of any shipment. Stop by today to get started. 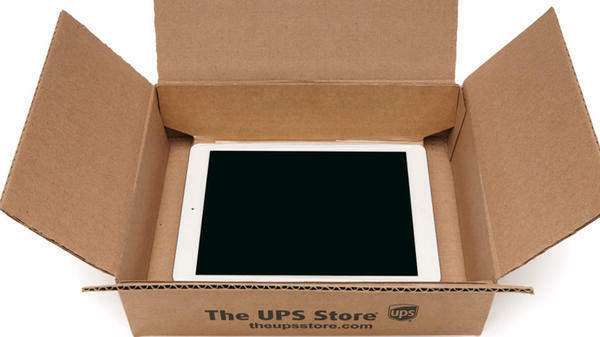 If you need to ship a laptop, ship a computer, or ship personal devices like a tablet or smartphone, we carry a suite of specialty electronic shipping boxes that are designed to provide extra protection for your equipment while in transit. With increased airport security and more flights operating at full capacity, airport check-in lines can take more time than ever. With the help of The UPS Store Lancaster, shipping luggage before your trip can save you time at the airport, plus those additional airline fees. Not to mention, you'll get peace of mind with our online package tracking and Pack & Ship Guarantee. Looking to ship golf clubs in Lancaster, PA? Let The UPS Store caddy your golf clubs to your favorite course. We offer golf club shipping solutions so you can rest easy knowing your equipment will meet you safely at your next golf destination. Need to move a couch, piano, dresser, or desk? Let The UPS Store handle the big stuff. We can pack and ship furniture so it arrives safely at it's destination. Whether it is for home or business, a single piece or an entire room, we can help you solve any furniture packing challenge. We can help with blanket wrap, protective covering or custom crating. Learn more about our Freight Shipping options for the really big stuff. Our certified packing experts are qualified to handle your precious high-value or sentimental items. We carry boxes in a variety of sizes and all the necessary supplies, such as bubble cushioning. We can even make custom boxes and crates. Let us handle all the details to crate, pack, and ship your fragile antiques. Need help packing and shipping a loved one's estate? The UPS Store at 590 Centerville Rd is your estate shipping resource in Lancaster. Whether you're a personal estate shipper or you're with an auction house or gallery, our Certified Packing Experts can help you pack and ship precious heirlooms so they arrive safely. 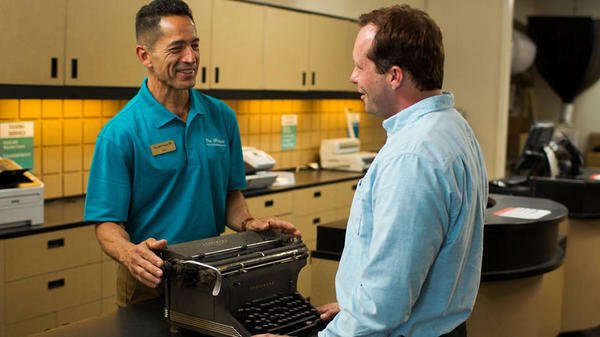 Did you know the UPS Store can print all your business brochures? Use this coupon for 10% off your full color tri-fold brochure. Limit one coupon per customer. Not valid with other offers. Restrictions apply. Valid and redeemable only when presented at The UPS Store located at 590 Centerville Rd. The UPS Store centers are independently owned and operated. © 2018 The UPS Store, Inc. This privacy notice ("Notice") describes the practices related to information collected by the individual The UPS Store entity L. Sue Morrison & Kristine A Frey (referred to in this Notice as "Franchisee", "our", and "we") from visitors to this website ("Website"). This Notice only applies to information collected on our Website(s). This Notice does not describe the information collection practices of The UPS Store, Inc., United Parcel Service, Inc. ("UPS"), or any of its subsidiaries or affiliates, or any other The UPS Store franchisee. To the extent required by applicable law, California residents may ask us to provide them with (i) a list of certain categories of personal information that we have disclosed to third parties for their direct marketing purposes during the immediately preceding calendar year, and (ii) the identity of those third parties. To make this request, California residents may contact us as at store1005@theupsstore.com. Welcome to the website of The UPS Store L. Sue Morrison & Kristine A Frey, a The UPS Store center location independently owned and operated by L. Sue Morrison & Kristine A Frey. This Website is provided by, or on behalf of L. Sue Morrison & Kristine A Frey. This Website may be accessed from various locations both within and outside the United States of America (“USA”). Access to and use of the Website, including functionality and features and products and services available through the Website, may be inappropriate, prohibited or restricted in certain jurisdictions outside of the USA. In addition, certain functionality and features and products and services available through the Website may not be available in jurisdictions outside the USA. We make no representations or warranties that the Website is appropriate or available for use outside of the USA. If you access or use the Website from outside the USA, you do so at your own risk and are responsible for complying with the laws and regulations of the territory from which you access and use the Website. This is a general audience website and users of all ages are welcome to browse the Website. However, if you are under the age of legal majority to form a legally binding agreement under applicable law, you should not use any of the products or services offered on the Website, download any Materials or Software, or provide any information about yourself through the Website. The Website Privacy Notice for The UPS Store center L. Sue Morrison & Kristine A Frey posted on this Website governs the use and disclosure of personal information collected from or provided by you at the Website.